One of the interesting things about Hilma af Klint (1862–1944) is that neither she nor her work can be written into the early history of abstract art. While her work predates that of the time-honored founders of abstraction (Robert Delaunay, Wassily Kandinsky, František Kupka, Kazimir Malevich, and Piet Mondrian, among others), stipulations in her will prevented it from being shown until twenty years after her death, and in fact was not publicly seen until 1986. Another interesting thing about her paintings is that they owe nothing to Impressionism, Orphism, Cubism, Dada, or Suprematism: they aren’t connected to any of the movements that are considered inseparable from the first decades of abstraction. 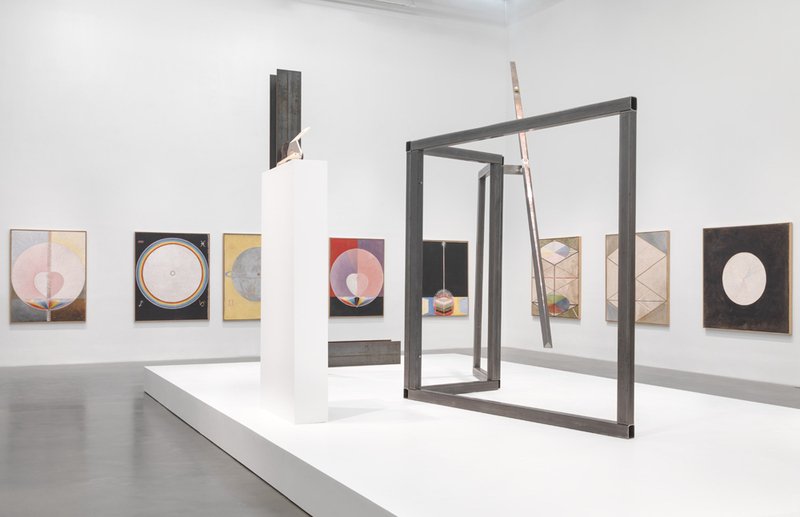 Af Klint’s work was first seen when sixteen of her paintings were included in The Spiritual in Art: Abstract Painting 1890–1985, organized by Maurice Tuchman with the assistance of Judi Freeman, at the Los Angeles County Museum of Art (November 23, 1986 – March 8, 1987). 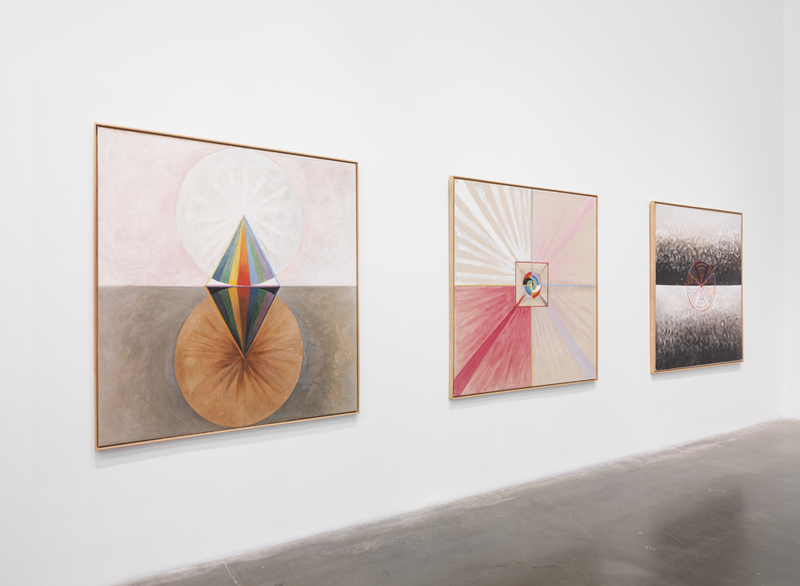 She was the subject of a small, eye-opening exhibition, Secret Pictures by Hilma af Klint, at P. S. 1 (January 15 – March 12, 1989), which was the first time her work was exhibited in New York. The fact that af Klint’s use of geometry had nothing to do with art history, Cubism, or the grid had an immediate effect on a number of artists who saw that show, most notably Suzan Frecon and Marilyn Lerner. [The] exhibition [is] dedicated to the act of preserving objects, artworks, and images, and to the passions that inspire this undertaking. A reflection on the impulse to save both the most precious and the apparently valueless, it brings together a variety of imaginary museums, personal collections, and unusual assemblages, revealing the devotion with which artists, collectors, scholars, and hoarders have created sanctuaries for endangered images and artifacts. While early abstraction artists, such as Mondrian and Malevich, aspired toward a pure visual language — which paved the way for the reductive drive of Minimalism — af Klint started off as an impure artist and seemed to have remained so until her death. 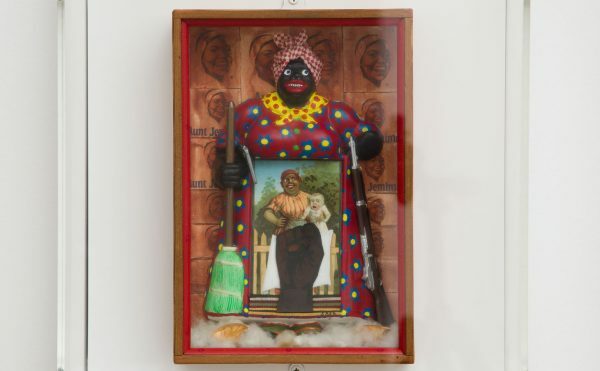 Her impurity, as well as her distance from all of the established ancestors of abstraction, is one reason why so many artists are interested in her work. She challenges the notion of hierarchical thinking and lineage, the long held belief that you had to take your cues from Paul Cézanne, Arthur Dove, or Albert Pinkham Ryder, for example. Af Klint studied at the Academy of Fine Arts in Stockholm, and was able to earn her living by painting landscapes and portraits. She was accomplished, if not particularly distinguished. In 1886, she formed a group of like-minded women interested in mediumship (communicating with the spirits of the dead) called “The Five” or “The Friday Group.” In 1888, she joined the Theosophical Society — as did Mondrian — and read the writings of Annie Besant and Charles Leadbeater, who believed that thoughts could be manifested as colored forms carrying the purpose of the messenger. While she clearly was adept at rendering the visible world, her interest in theosophy led her to believe that painting was the best medium for bringing the invisible or occult world into the visible. The pictures were painted directly through me, without any preliminary drawings and with great force. I had no idea what the paintings were supposed to depict; nevertheless, I worked swiftly and surely, without changing a single brushstroke. The sixteen paintings chosen for the New Museum exhibition are from two series, The Dove and The Swan. In their selections, the curators focused on the most abstract, least figurative paintings from the series. The dove is the Christian symbol for peace and harmony, a domain without discord, while the swan is the embodiment of purity to the alchemist; it is the highest spiritual state. 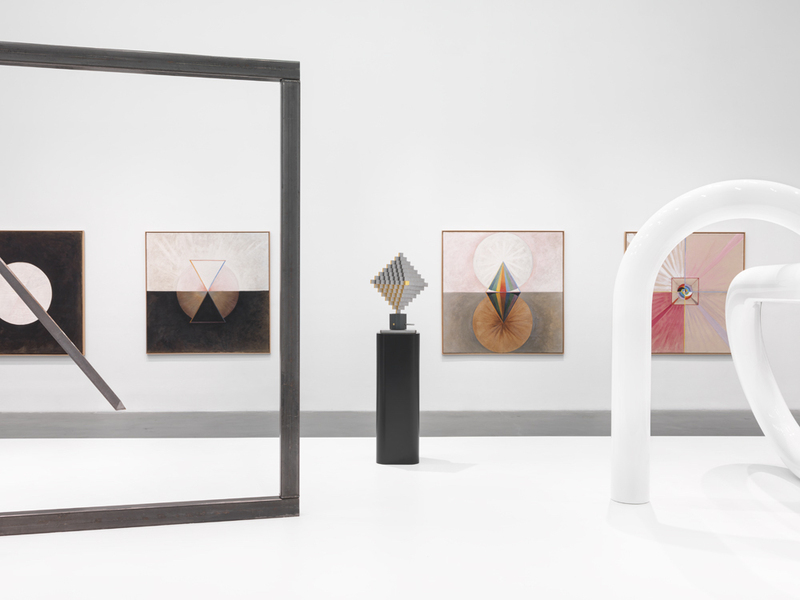 Influenced by Goethe’s theories of color, and his claim that he saw black and white emanate through a prism, it is evident that af Klint uses color symbolically. In “The Swan, No. 17, Group IX/SUW” (1914-15) — which is one of the most abstract paintings in the exhibition — we see a circle in the center of a red ground. The circle has been divided in half vertically, with a white band on the left enclosing a black semi-circle. The right half consists three colors. There is a blue band on the outside, a yellow band inside the blue, and finally a pink semi-circle that is significantly smaller than its black counterpart. At the center of where the two semi-circles meet af Klimt has painted a triangle divided perpendicularly, red on the left and black on the right. Af Klint believed that blue represented femininity, while pink and yellow represented masculinity. Pink stood for spiritual love, while red stood for physical love. 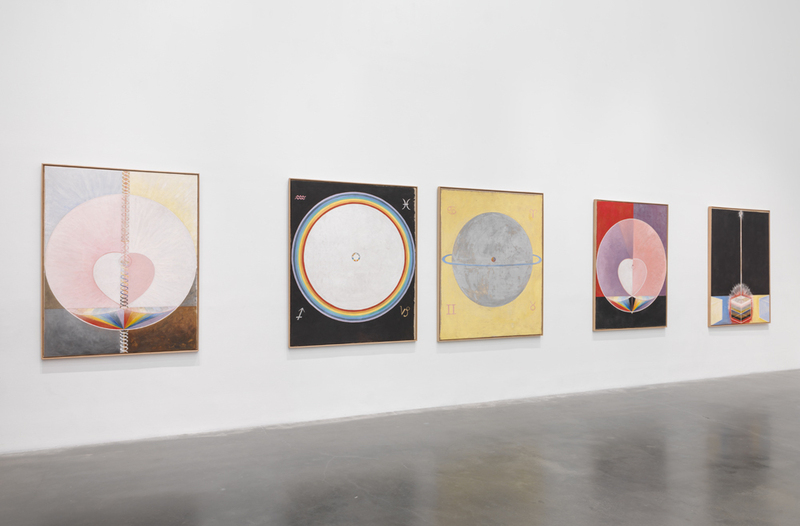 While we can see an iconographic connection between af Klint’s circles and many of Kenneth Noland’s paintings, this link seems beside the point. Af Klint’s painting is an esoteric diagram, a relative of paintings by Alfred Jensen. One reason the paintings feel modern is their scale. Meant for a temple, the “swan’ paintings are around five feet square. Af Klint wasn’t a materialist and she was not interested in attaining the purely optical. Her belief that paint was the best medium to record the messages sent to her by a High Master is on the opposite end of spectrum occupied by high modernists, such as Noland and Frank Stella. Af Klint, who brought together a range of vocabularies her work, made no separation between sign, representation, diagram, and color wheel. She made no distinction between her readings in science and her interest in astrology. Some of the paintings come across as arcane diagrams, while others have the signs of the zodiac in each corner. Af Klint’s impurity is one of the reasons why so many artists are interested in her work. Whereas the point might have once been to drive everything out of painting, to make it be only about the paint, the tide has long since turned. Now it is about what you can get into a painting. She isn’t interested in developing a pure vocabulary, which is something she shares with contemporary abstract artists as diverse as Raoul de Keyser, Stanley Whitney, Thomas Nozkowski and Brenda Goodman, to name just a few. Just as af Klint had nothing to do with what’s going on around her at the time, these artists had to find a way past Abstract Expressionism, Pop Art and Minimalism without looking back. Another reason she is so important is that she believes in painting: it could put her in touch with something that lies beyond appearances. 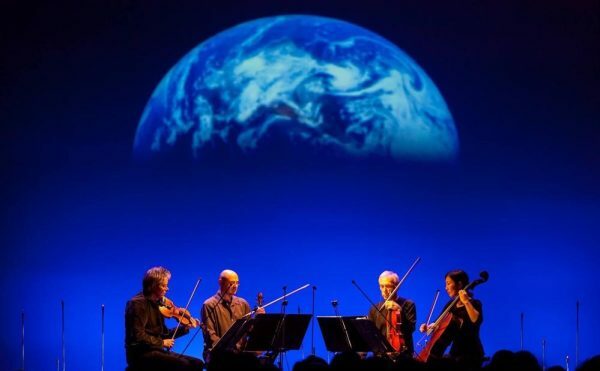 It could show us something we hadn’t seen before, something we needed to see. And yet, whatever her motivation, the paintings exceed her, become something more than anything she might have imagined. Isn’t that the dream?